The GU at USF game could be the best of the bunch based upon both team’s performances on Wednesday (Root TV @ 8 PST). Santa Clara was within 1.9 seconds of beating Gonzaga on Thursday....if it weren't for an unlikely 3-pointer from Sam Dower, SCU would have been the 2nd WCC team to beat GU this season. In the Pilots loss to SCU, 76-68, in December, Brandon Clark, Evan Roquemore, and Jared Brownridge each scored 20 points. But it was the freshman Brownridge who most impressed those of us who saw him in person...….so I decided to compare his numbers (so far) with another successful SCU guard, two-time WCC Player of the Year, Steve Nash, in his freshman year. Well, UOP wins on the road by 17, 84-67, so maybe it's the day of the underdogs! SCU employing a hack-a-alec strategy. Com'n Pilots, finish this. Brownridge was pretty unstoppable tonight with 20 points. But a new career high of 28 for Thomas, and good defense on Clark and Roquemore lead to a good Pilot win, 76 - 64! My Goodness Thomas must have eaten his spinach tonight. 9/10 from the field, 10/10 from the line 28 pts 11 boards! Good win. I know the Keurig and Ruby Tuesday jingles by heart too. Go Hawks! 52% shooting overall by the Pilots, and 86% from the FT line. Only took 7 3PTs, only made 2. 35 to 24 rebounding advantage. Only 9 TOs. Pilots are now in 6th place alone, one game ahead of USD. up7587 wrote: Brownridge was pretty unstoppable tonight with 20 points. But a new career high of 28 for Thomas, and good defense on Clark and Roquemore lead to a good Pilot win, 76 - 64! SCU is a VERY guard-centric team....and UP really shut down the guards in the 2nd half....I think that was the key to the win. Thomas finally looked like he was having fun again after putting way too much pressure on himself to score in the losses to USD and USF. He doesn't need to score 28 for the Pilots to win, but it sure makes it more comfortable when he does. Tip of the cap to the once masked man, KB, for going over the 1,000 point mark tonight (Rhino did it earlier in the year), in his third season on the Bluff. Loved seeing the Pilots calmly knock down FT after FT to put this one away - would you believe that their last field goal came with almost five minutes left in the game? van der Mars obviously huge tonight, but Wintering was also key with six assists, no turnovers, and many of the aforementioned late free throws. Brownridge with an off night and he still gets 20, would imagine him and Mika will be battling for WCC Rookie of the Year - though I would argue that no freshman has been more valuable to his team than Wintering this season. I love the game that Alec brings to the team. Only issue I see is his drives to the hoop on fast breaks where he usually gets blocked. But no turnovers makes up for that. Love his reach in steals, too. Two "upsets", UOP and UP each won. The best game (not counting the UP/SCU game) was GU @ USF, but then it got away from the Dons when Pinkins and Dickerson fouled out. SMC hung tough with scrappy BYU until Waldow got upset and threw his mouth piece across the floor drawing a technical, and his 4th foul, before eventually fouling out. BTW....in the SMC @ BYU telecast there were two females (Beth Mowins and Kara Lawson) providing the play-by-play on ESPN2.....I've never seen two women work a men's game before. Good for you, ESPN. up7587 wrote: Pilots are now in 6th place alone, one game ahead of USD. UP’s remaining games are GU, USD, BYU, SMC, and UOP on the road, and LMU and PU at home. Had to go back to the box score to make sure we won. up7587 wrote: I love the game that Alec brings to the team. Only issue I see is his drives to the hoop on fast breaks where he usually gets blocked. But no turnovers makes up for that. Love his reach in steals, too. Wintering has been getting his fast break layups blocked quite consistently -- once or twice per game over the past few weeks, it seems like. Yes, he is just a freshman, but after making the same mistake over and over, you'd think he and his coaches would figure out a different course of action. Wasting fast break opportunities is a real momentum killer. It was great to see the Pilots keep the pressure on and slowly pull away in this game. Enough defensive stops and enough baskets made to give us a chance to win it at the free throw line. And we excelled from the charity stripe tonight. Without actually investigating, I bet 7 is a season-low for three-pointers attempted. Great game plan tonight to pound the ball inside - and Thomas and Ryan made the coaches look brilliant with their great performances. Bailey played a great game. He only scored 10 points, but he was extremely efficient: 5-8 shooting. Congrats on the 1,000 point milestone. My one gripe is that he needs to stop bringing the ball up court in traffic. He has had his pocket picked repeatedly by conference opponents this season when he does that - including once tonight. You can usually see the steal coming when tries to lead the fast break. A real head-scratcher that the coaches haven't 'encouraged' him to get the ball into the hands of one of the point guards. We'll need to be firing on all cylinders on Wednesday. Here's hoping that Thomas has another big game, and that Bryce and Bobby can find their shooting groove. Go Pilots! HaHa. Those highlights show every basket Brown and Clark made. I guess making FTs doesn't make for a good highlight reel. Especially when it's SCU's video and announcers. Check the logo in the bottom right. I stopped by my local newsstand to see if there was any Pilot coverage in the O. I'm a masochist. As expected, none whatever. But this isn't a rant on Pilot coverage. There was NO college basketball coverage whatever. The sport does not exist. No articles, no scores, no nothing. Not one college sports article. Just mind boggling. Six articles from local reporters. One by mike Richmond on some Jefferson HS players getting free tickets to the blazer game. One on the Blazers from Tokito and a piece from Quick that could have been written last week. One from Goldberg on the Timbers first training camp game. Ok, I get that. Two pro teams deserve some coverage. And a Heartstrings piece from Canzano about Krieg and the special Olympics. Bill Monroe on the fishing show that mainly details what Oregonian advertisers are giving out tickets. All the rest of the six pages was wire service Super Bowl stuff, which I'm sure we will be sick of before the day is done. It's official. Paper is dead. 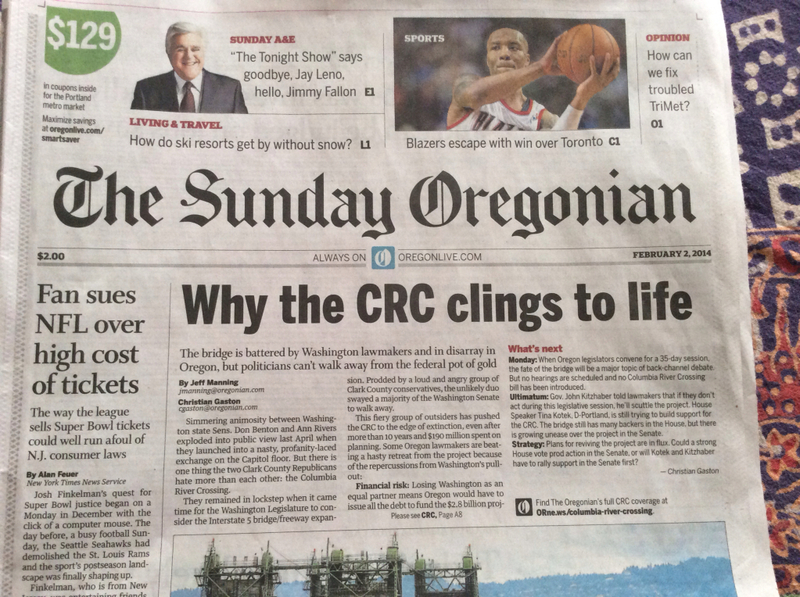 Portland has nothing they can call a newspaper. Geez, once again I am in no way defending what was once the Oregonian, but I'm guessing the newstand edition you picked up was just a Saturday paper wrapped in the Sunday Funnies. :read:The home edition did in fact mention all the local games and the scores from across the nation on pages C9-C11. DoubleDipper wrote: Geez, once again I am in no way defending what was once the Oregonian, but I'm guessing the newstand edition you picked up was just a Saturday paper wrapped in the Sunday Funnies. Just checked with the neighbor who gets home delivery. Like the one I saw this morning, theirs ends at C8, which is the full page Fry's adds that usually signals the last page. Their issue is the same and contains no scores. Also doesn't have any marking or masthead that identifies it as anything but today's paper. AND IT HAD LAST NIGHT's BLAZER GAME, as I explained. Unless Marty McFly is the editor, I don't see how it could be yesterday's. I watched the blazers, the Pilots, and the BYU game at BWW last night. The blazers were done before I left, and I watched the end of the BYU game at home. Even if that is the case, they are misidentifying the product, which is another sign that it is in the death throes. Maybe the Irvington district is too far to get timely delivery ( 8 blocks from LLoyd center). That still makes it worthless. They need to fold the thing up to make room for another publisher to come in. It would be the decent thing to do. It's what will happen eventually anyway. I do. But I'm also about the 12's in Seattle. Born and raised and proud. Go Hawks! Go Pilots! Go Falcons! Go TWolves!